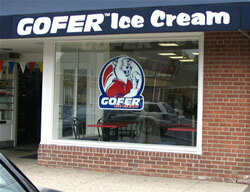 If you are looking for information on the Gofer Ice Cream franchise business opportunity, Gofer Ice Cream franchises or Gofer Ice Cream franchising, then you have come to the right place. Our Brand is based on the simple premise of selling high quality American Style ice cream in clean and inviting retail environments, without the use of gimmicks or catering to the latest ice cream fad. We focus equally on hard hand-dipped and premium soft serve ice cream products. Our menu also includes fat free treats, such as smoothies and "Gofer Lite", as well as the associated cakes and novelties. Our shops are bright and family oriented. Warm welcomes by our staff are often accompanied by the smell of fresh made waffle cones, which are created several times a day. 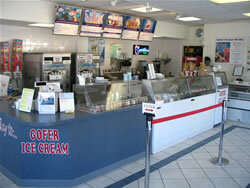 The concept, from a franchisee's point of view, is to be a quick service and efficient operation. The system allows for a typical shop to function with minimal staff lead by a motivated owner operator. Access to our exclusive Gofer Extranet site, (The Gofer Network) developed for franchisees to help operate, manage and communicate with all members of the "Gofer family"
We teach you everything you need to know to open and operate your own Gofer Ice Cream shop.